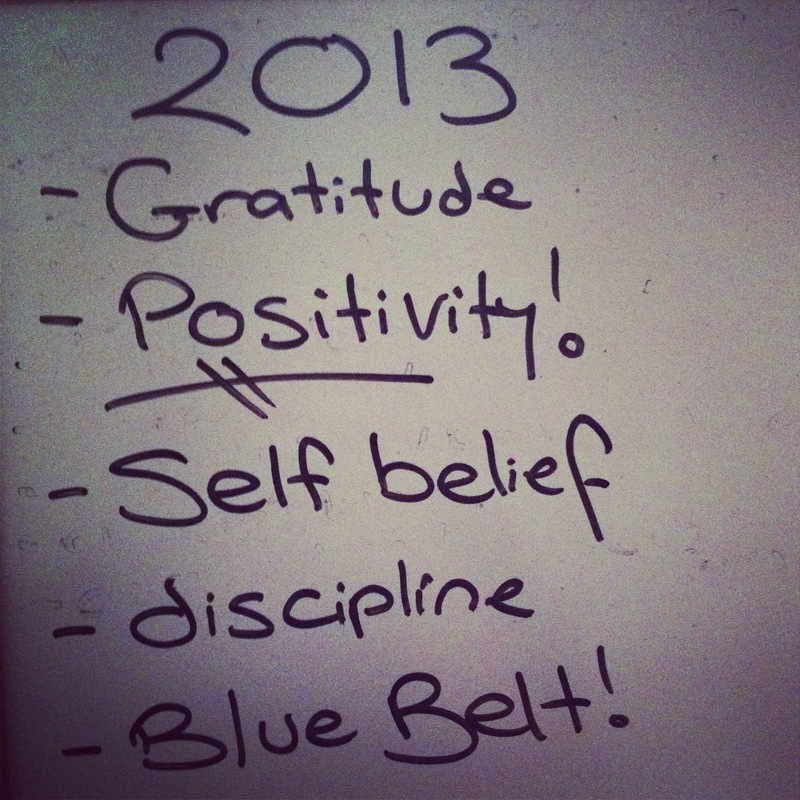 Let’s just draw a line through that last New Year’s Resolution – I’m a one-stripe white belt with a back injury – I am NOT getting my blue belt in the next six months. And I’m completely okay with that! Late last year when I wrote these resolutions I was training hard – very conscious of how quickly my teammates were progressing – I felt this desperate need to prove myself and keep up. While Sensei had told us it’s not uncommon for people to be on the same belt for a number of years in BJJ, other students I was meeting and mixing with were moving to blue belt within a year to 18 months. That goal was going to be a big motivator I figured, a commitment to keep up the training and progression. But a few things got in the way.. I took a month off for a trip to Europe, couldn’t make class for a few weeks because of work, couldn’t make my old class times AT ALL because of a work shift change, hurt my back and haven’t trained now for more than a month. – Life gets in the way. Injury gets in the way, and it’s okay! Not everyone is going to be able to commit to every class and every tournament – not everyone can be on the winner’s blocks at comps and become world champions. – There is such a thing as a ‘natural’ in this sport, (to a degree) body types, competitive attitudes and athletic backgrounds count for a LOT. I have no advantage in this area. – It’s not a race. I can be thrilled and in awe of my BJJ friends and teammates as they collect more stripes and medals and proudly wear in a shiny new belt colour, and not feel like I’m being left behind.. because the only person I’m competing against is myself. For now, the mission continues to treat and strengthen my back so I can be ready to roll when I jet off in 4 weeks time. And if it’s still not good by then? I’ll pack a shiteload of painkillers and just keep working on it. I’ve hda to come to the same idea. 3 of us got our blue belts at the same time, I feel like im falling behind. After being promoted, I started teaching kid’s classes. So that takes up some of my training time. Don’t get me wrong, I LOVE teaching the kids program, but I am falling slightly behind. It’s something I have to accept. We’re all on our own little journeys in this sport – it’s so easy to be caught up in the buzz of team wins and comps and gradings, but I’ve decided the next big win for me will just be getting back on the mat. =) the stripes and belt will come when they’re meant to! Previous Previous post: Missing The Mat. Next Next post: Bottom Up!